Split release featuring the damaged, heavy electronics of Canada’s Wet Nurse. teamed up with the obsidian atmospherics of Idaho’s Ten Thousand Miles of Arteries, two acts who take different approaches but are bound by sharing a similar proclivity for making polluted and deranged soundscapes. 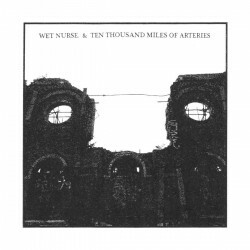 Wet Nurse opens things up with “Vow of Sickness (A Prayer), a barrage of jammed frequencies and lurching, corrosive synth waves with a fearsome and highly agonizing vocal presence that sets the tone for the proceeding two tracks. For fans of IRM, early Haus Arafna, and STROM.ec, Wet Nurse. create a disorienting, visceral sound that melds structure with chaos, and ripples with angst, tension and intensity.Ten Thousand Miles of Arteries follows with 4 tracks of soul blackening, brooding arrangements, teeming with malevolent, noir-ish ambience and corrosive drones, sprinkled with darkened melodies and structure, and propelled forth by percussion and vocals that cut through a haze of reverb and distortion. It’s a deftly crafted, emotionally harrowing and bleak listen, ever so vaguely reminiscent of early Navicon Torture Technologies even while coming off as wholly unique.